Real Madrid have stumbled at the Balaídos Stadium this Wednesday night, in a 2-1 Copa del Rey 1st leg loss, against Celta de Vigo. The home side created plenty of difficulties to the Spanish champions and only a Cristiano Ronaldo late goal with 5 minutes left to the end has saved the Merengues from a total disaster. The 2nd leg will be played on January 9 (2013), at the Santiago Bernabéu, precisely two days after the FIFA Balon d'Or 2012 winner is announced to the World. It could have been worse! That's certainly part of the thoughts crossing most of the Merengues' minds, after seeing Real Madrid falling against Celta de Vigo, in a Copa del Rey first leg 2-1 loss. The home side showed no signs of fear whatsoever, against a theoretically stronger team that they had ahead and surprised José Mourinho's men throughout the entire game. With Gonzalo Higuaín still unavailable and Karim Benzema forced to leave the pitch after picking an ankle injury, the Merengues struggled to retain the ball upfront and it had to be Cristiano Ronaldo scoring the vital goal, with 5 minutes left for the final whistle and already in a desperate moment of the game for Real Madrid. 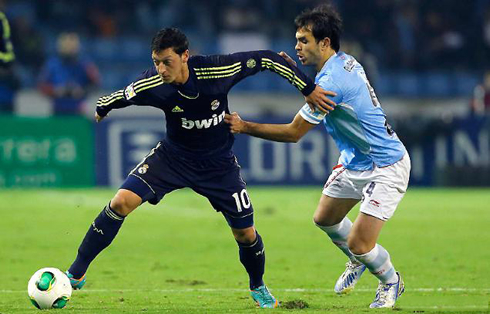 The two teams will face again for the 2nd leg at the Bernabéu, on January 9, 2013. There were no goals scored during the first 45 minutes, but if there was any side deserving the lead at half-time, it would have to be Celta de Vigo. The home side are currently ranked 15th in La Liga, but from what we've seen last night, they have enough football to fight for spots at the first half of the table. 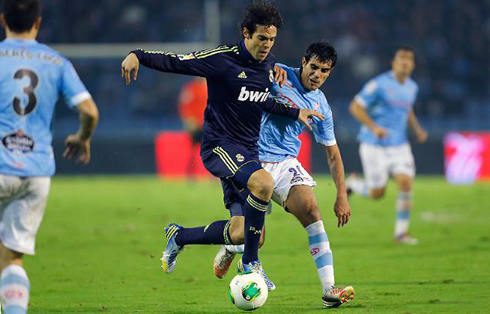 The Merengues were kind of handcuffed by Celta de Vigo in most of the moments in this match and without any good attacking solutions in both the left and right back positions, the highly needed support to the front men with crosses and overlaps down the wing never existed, and Mourinho's tactics got too predictable as they bumped into a well organized home defense wall. Losing Benzema (ankle injury) roughly after the first half an hour of the game surely didn't help much in finding a good rhythm into the game. With Higuaín still out of the action for a few more weeks and Real Madrid's 3rd striker, Alvaro Morata, dismissed by José Mourinho for this particular game, the Portuguese coach had to be a bit creative when moving his chess pieces on the pitch. 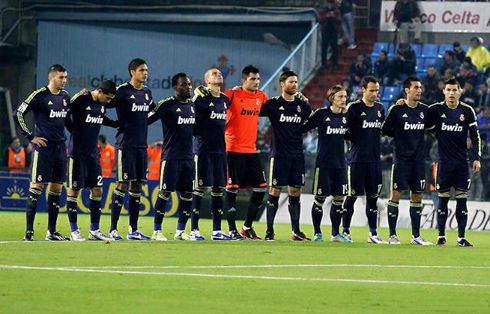 As a good proof of that, Callejón, Cristiano Ronaldo and Varane (a center defender! 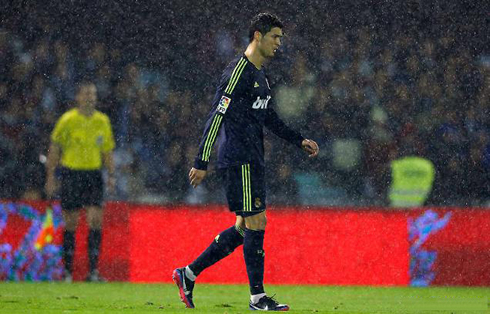 ), all proved the striker role during the game. Celta de Vigo got the opening goal in the 56th minute of the game, in what will inevitably be a controversial play. 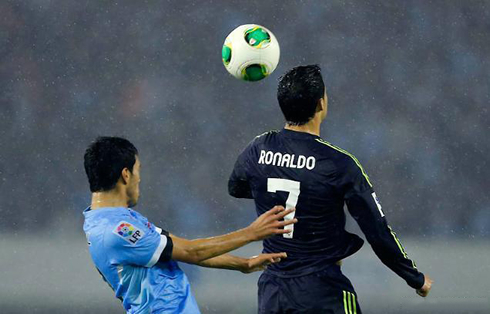 Cristiano Ronaldo had a late challenge from behind on Lago and got lucky to escape a 2nd yellow card. The play kept on, and moments after that incident, Krohn-Dehli worked well to get away from Varane's tight marking and crossed the ball into the back of Real Madrid's defense. Mario Bermejo met the pass at the far post and with a nice finish, he made the ball get past between Adán's legs, making it 1-0 to Celta de Vigo. Things would get more dramatic to José Mourinho side later on, with Celta de Vigo scoring their 2nd in a ball that was lost by the Merengues near their own penalty area. Pepe tried to rush a throw-in on the right side and ended up sending the ball towards an helpless Xabi Alonso, who had no space to receive it as he was already being guarded by several Celta de Vigo players. The ball felt into Bustos feet, who then ran with it a few meters ahead, just before striking a terrific shot from outside the area, beating an hopeless Adán. 2-0 for Celta, which was certainly a very dangerous result to attempt to get back from at the Bernabéu, that is, if the Merengues would fail to react in the remaining minutes. Fortunately, the reaction appeared 10 minutes later and it was Real Madrid's main man, Cristiano Ronaldo, rescuing what might end up being a vital goal when it comes to decide who will get through on this last-16 round. Xabi Alonso spotted the Portuguese forward free from any opponent's marking, as he was starting to run forward. He sent a perfect high ball to CR7, who then showed his goalscoring instinct and coldness in front of goal, with a left foot first touch finish that only ended in the back of the net. Cristiano Ronaldo next game for Real Madrid will be against Espanyol, for the Spanish League 'La Liga', next Sunday (December 16, 2012). You can watch Juventus live stream, Real Madrid vs Espanyol, Barcelona vs Atletico Madrid, Manchester United vs Sunderland and New York Knicks vs LA Lakers live, all matches provided from our football streamings section.